The Department of Transportation has been collecting data about daily personal travel patterns via two different, periodic surveys going back to 1969. Subsequent survey years have been: 1977, 1983, 1990, 1995, 2001, 2009, and 2016 (underway). The 2009 National Household Travel Survey (NHTS) provides data to characterize daily personal travel patterns across the country. The survey includes demographic data on households, vehicles, people, and detailed information on daily travel by all modes of transportation. 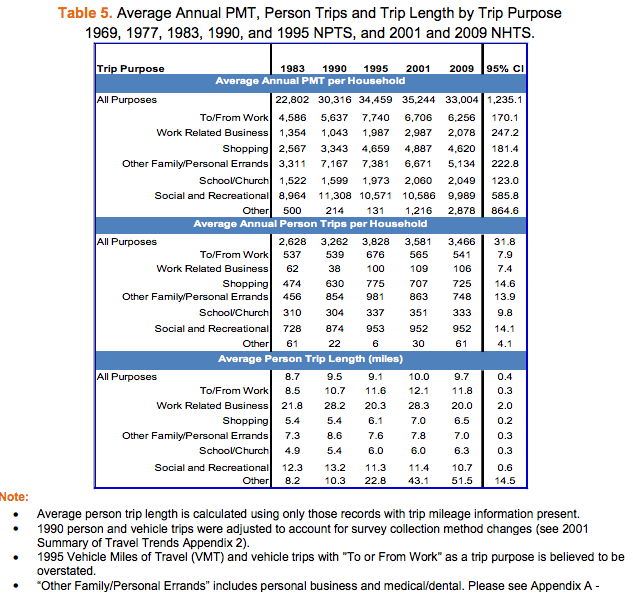 NHTS survey data is collected from a sample of households and expanded to provide national estimates of trips and miles of travel by travel mode, trip purpose, and other household attributes. 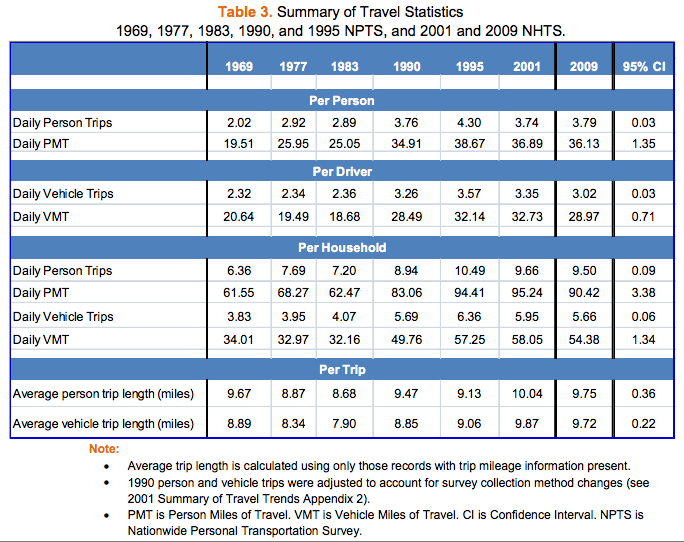 When combined with historical data from the 1969, 1977, 1983,1990, and 1995 NPTS and the 2001 NHTS, the 2009 NHTS serves as a rich source of detailed travel data over time for users. This document highlights travel trends and commuting patterns in eight key areas – summary of travel and demographics, household travel, person travel, private vehicle travel, vehicle availability and usage, commute travel patterns, temporal distribution, and special populations. A. Santos, et al. 2011. 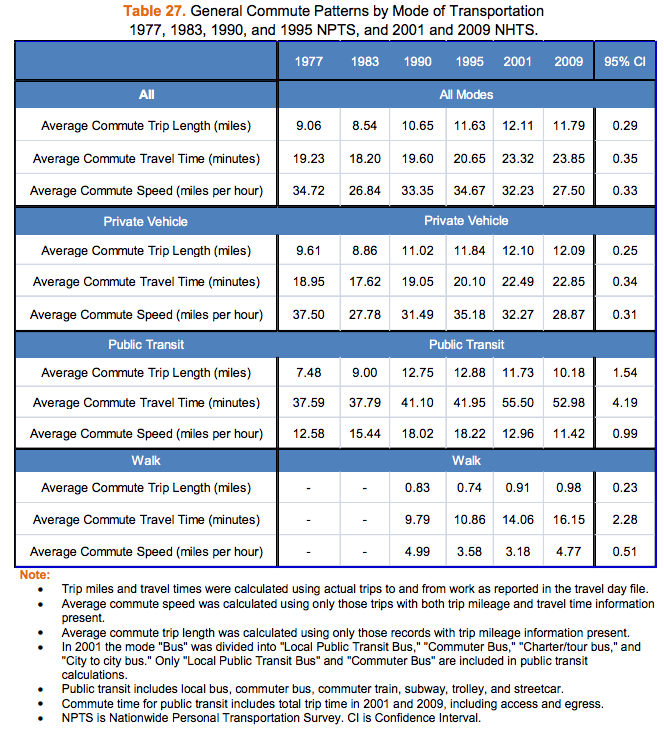 The Bureau of Transportation Statistics publishes historic data on annual passenger-miles in aggregate, broken down by method of transportation. The chart currently shows data from 1960-2014. Department of Transportation. Bureau of Transportation Statistics. Accessed November 8, 2016. The Census Bureau (in addition to the Dept. 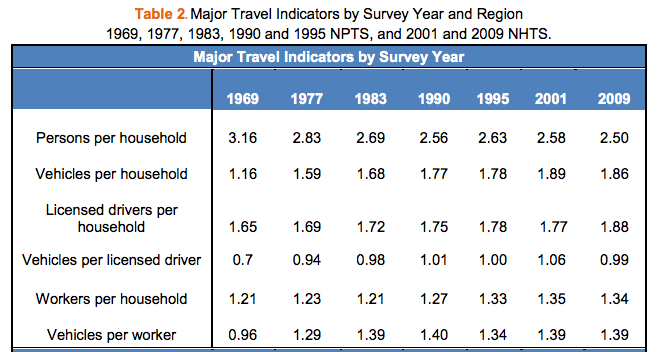 of Transportation) has asked survey questions about daily travel patterns going back to 1980 (and back to 1960 for a couple of very specific questions). Questions have been asked during the decennial census (since 1980, maybe 1960), and during the “American Community Survey” (going back to 2005). Beth Jarosz and Rachel T. Cortes. September 2014. U.S. Census Bureau, Decennial Census 1960, 1970, 1980, 1990, 2000, and American Community Survey 2013. United States Census Bureau. 2005-2014. 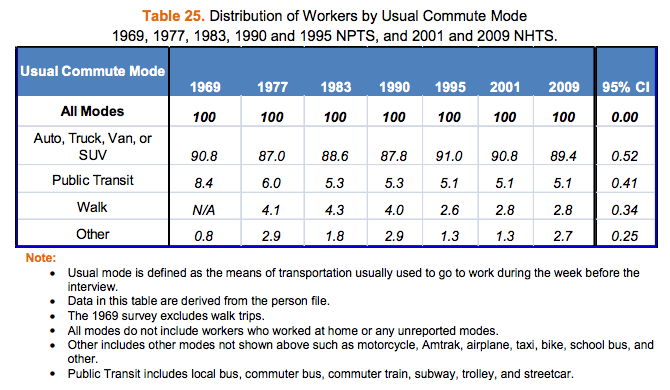 “American Community Survey.” Table S0802: Means of Transportation to Work by Selected Characteristics. 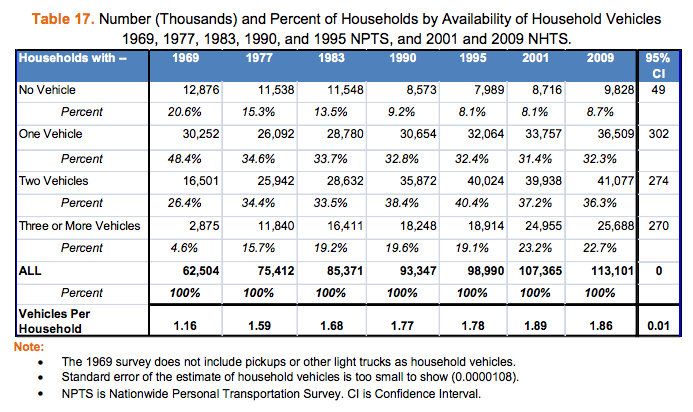 This article presents data and extrapolations explaining why urban commute times have not increased more dramatically, despite decades of urban sprawl. One study (Alex Anas, SUNY Buffalo) extrapolates commute times for the Chicago metro area from 2000 to 2030. 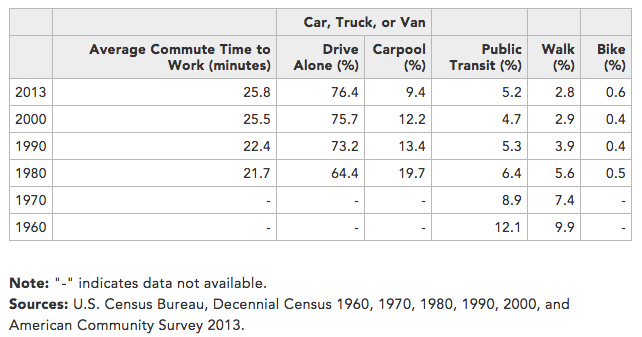 In that time, there is a 24% jump in population, leading to 19% more urbanized land (sprawl), but only a 4.5% rise in commute time (from 30 minutes to 31.7 minutes). Another study (MIT Senseable City Lab) examines cell phone data to track commutes around the world. The study finds travel time, on average across the world, to be largely independent of distance. The article says that these studies seems to support the theory of “travel time budgets,” developed first by Yacov Zahavi and further by Cesar Marchetti (that travel budgets have averaged about an hour throughout history, and across the world). Both studies seem to support the idea that people adapt their lifestyles to accommodate an average travel time budget, whether by changing mode of transportation (e.g. : switching to public transportation), moving closer to their jobs, or reducing trips that aren’t commutes. TO-DO: ANAS’ MODEL MAY BE IN THE PROCESS OF BEING APPLIED TO LOS ANGELES AND OTHER METROS. INQUIRE ABOUT GENERALIZATION TO THE US. The new report’s 30-year estimates predict even less rapid growth in driving, forecasting that total driving miles will increase only 0.75 percent annually from 2012 to 2042. With population growth estimated to average 0.7 percent each year, this leaves per-person driving miles essentially flat. 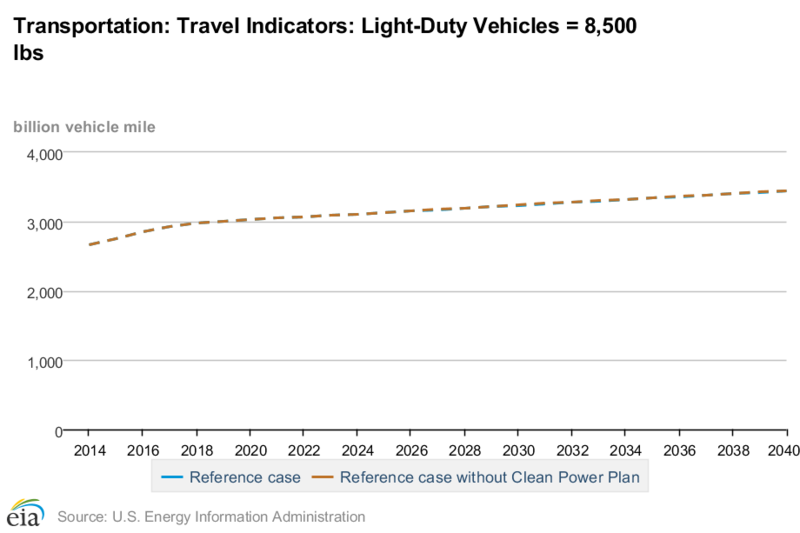 “This represents a significant slowdown from the growth in total VMT experienced over the past 30 years, which averaged 2.08% annually,” says the report. Federal Highway Administration. May 2014. 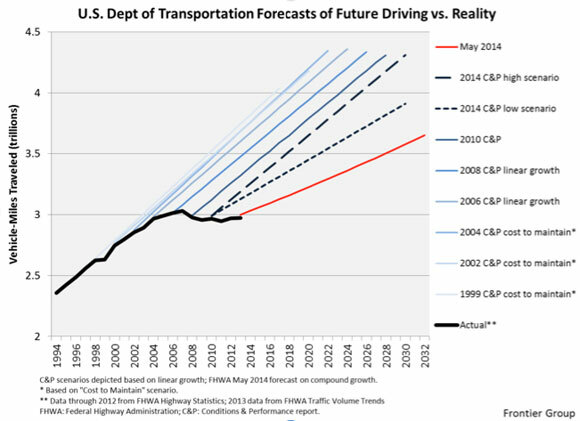 The Federal Highway Administration’s spring 2016 forecast revises the growth outlook even further downward. 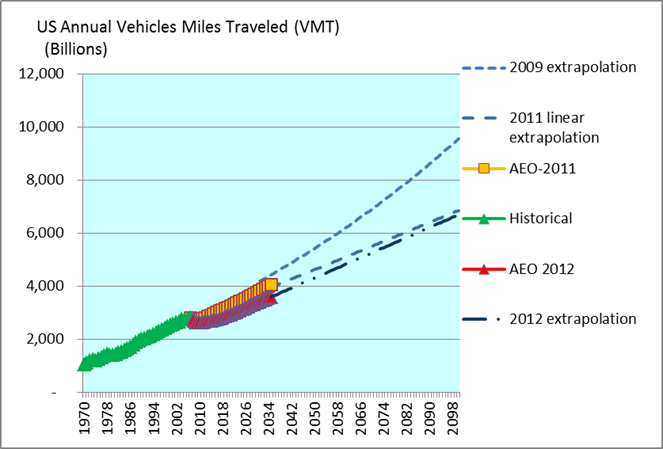 Growth in total VMT by all vehicle types is projected to average 0.92% annually over the next 20 years (2014-2034). 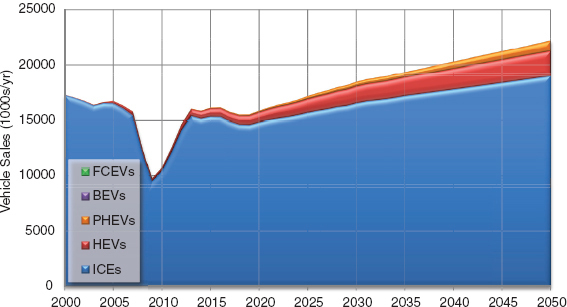 Over the entire 30-year forecast period (2014-2044) the average annual growth rate is projected to be 0.61% annually, as growth is projected to slow to 0.30% annually during the last decade (2034-2044). 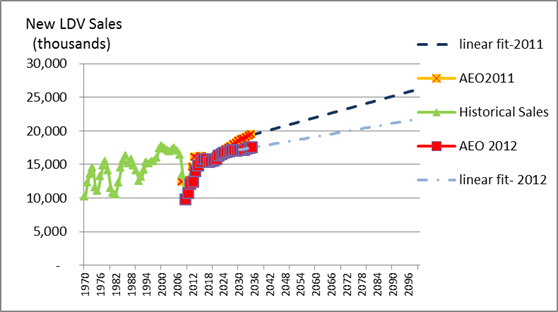 This outlook represents a significant slowdown from the growth experienced over the past 30 years, when growth in total VMT averaged 2% annually, although more detailed analysis shows that growth in overall motor vehicle travel per Capita was already slowing throughout most of that period. Federal Highway Administration. May 2016. Visit the source URL for data (many export options). US Energy Information Administration. 2016. NOTE: ONLY THE DATA TABLES ARE CURRENTLY AVAILABLE. THE EXECUTIVE SUMMARY AND OTHER NARRATIVE PARTS OF THE REPORT WILL BE AVAILABLE AFTER JULY 21, 2016. CHECK BACK HERE. 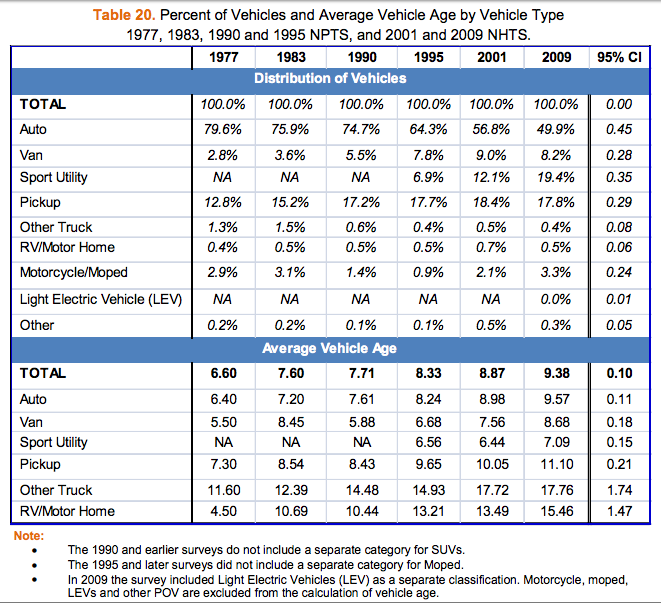 “LDV VMT & Sales.” Alternative Vehicles. TO DO: CONTACT DR. C.E. (SANDY) THOMAS TO ASK IF THERE HAS BEEN A RECENT UPDATE. 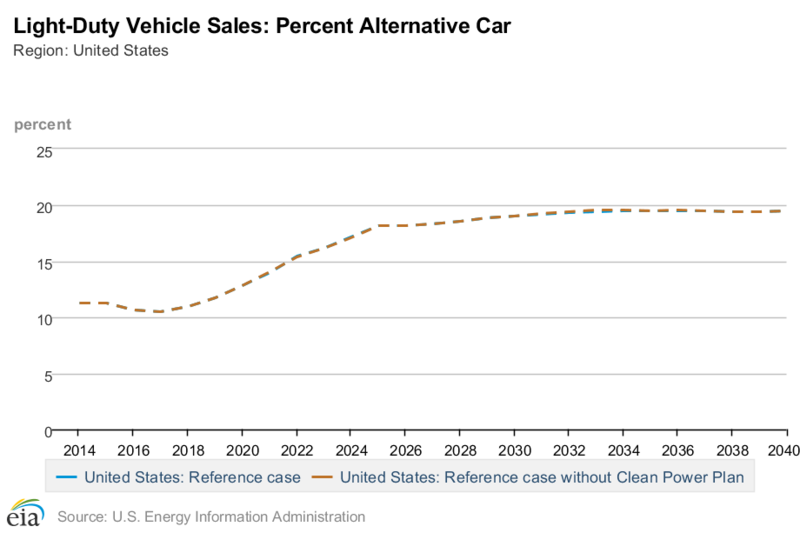 In the [business as usual] case, new-vehicle sales increase to 22.2 million in 2050 from 10.8 million units in 2010 (a year in which sales were severely depressed due to the recession). 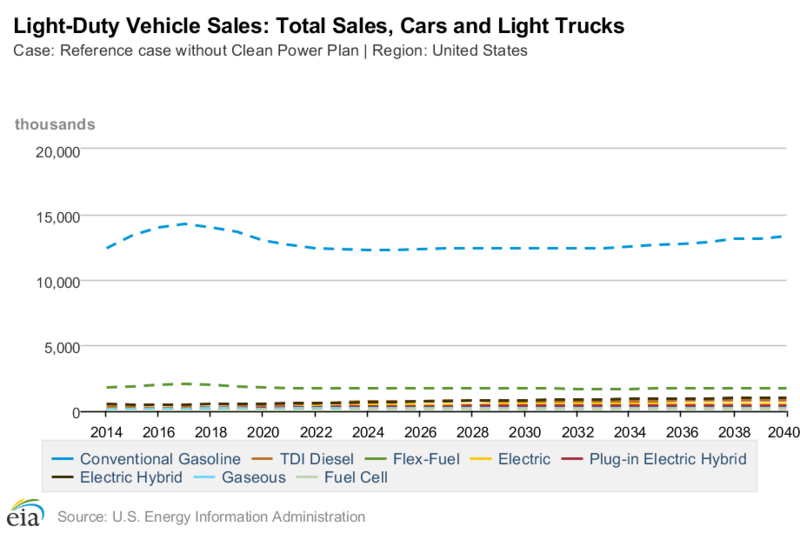 Diesel, hybrid, and plug-in hybrid vehicles make modest gains in market share (Figure 5.1). The total stock of LDVs increases from about 220 million in 2010 to 365 million in 2050. 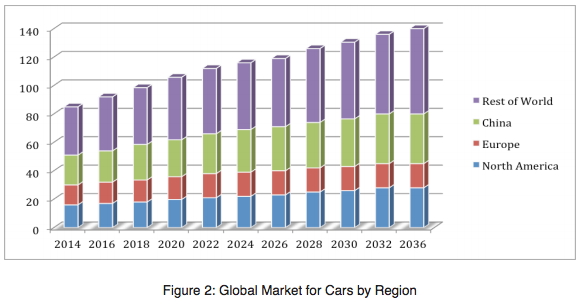 FIGURE 5.1 Vehicle sales by vehicle technology for the business as usual scenario. 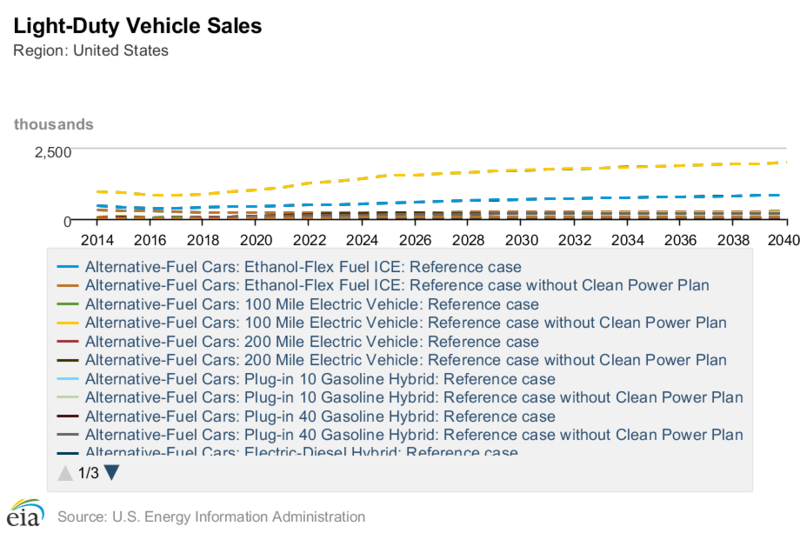 Transitions to Alternative Vehicles and Fuels. Chapter: 5 Modeling the Transition to Alternative Vehicles and Fuels. 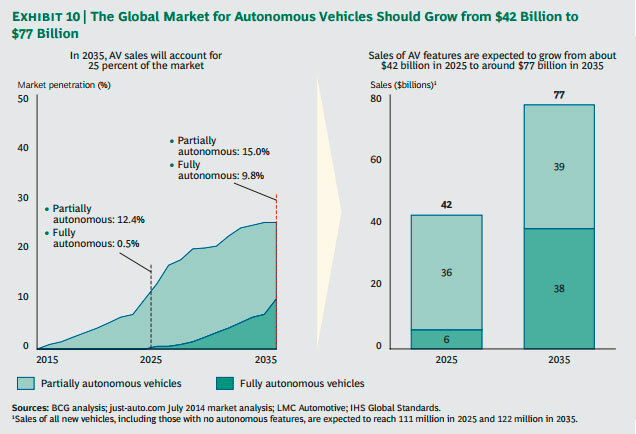 IHS forecasts 76 million autonomous vehicles will have been sold globally through 2035, with 21 million of those being sold that year. IHS expects a global CAGR of 43% between 2025 and 2035. TO DO: ASK IF THEY CAN SHARE ANNUAL DATA POINTS. Boston Consulting Group. April 2015. 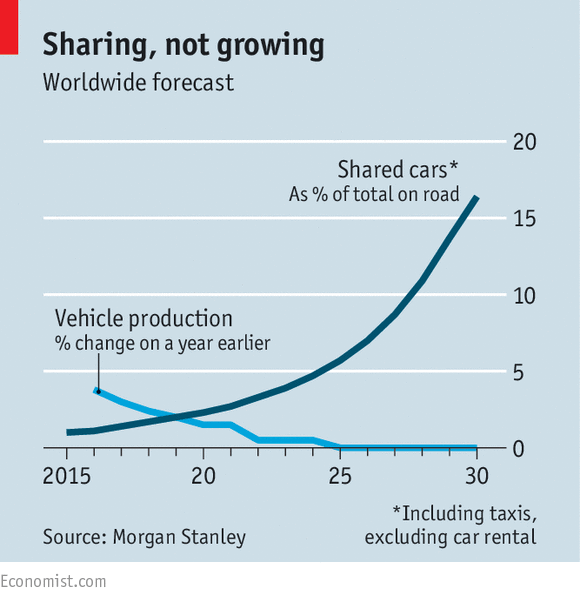 Note: The report uses expectations for the U.S. as an accurate proxy for the global market-penetration. This is based on adoption rates in the U.S. for adaptive cruise control being in line with overall global adoption. NOTE: The authors are from Google, Samsung, Yahoo, and Altera, but the data above is not sourced. 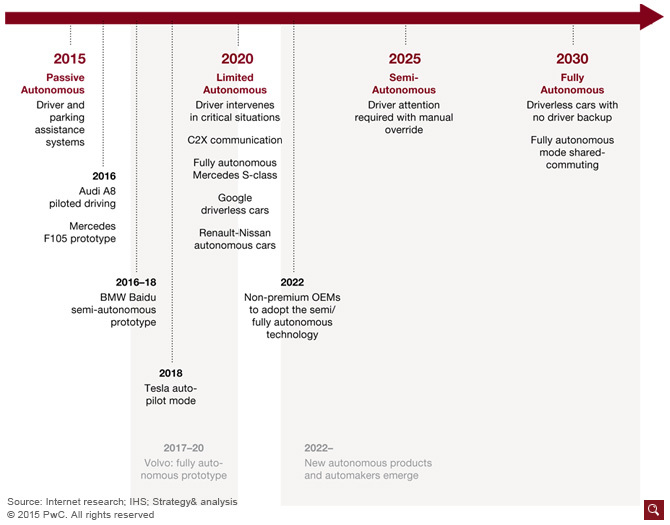 In 2012, IEEE said that it expected autonomous vehicles to account for up to 75% of cars on the road (globally) by 2040. TO DO: TRACE THE SOURCE. POSSIBLY ALBERTO BROGGI, UNIV. PARMA, ITALY. Richard Viereckl et al. September 2015. NOTE: Although this paper is focused on the European Union, I believe this timeline is general to the industry as a whole.